The social media agency Carrot Creative has a holiday card that’s a lot of fun. 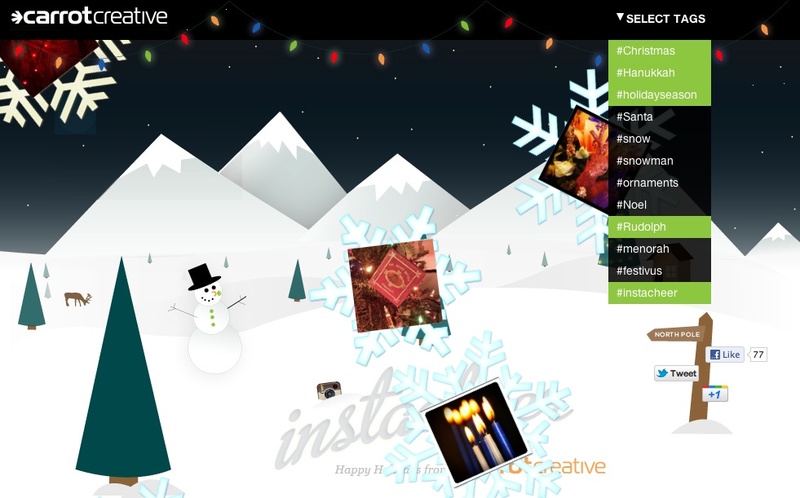 It combines a live feed of Instagram photos with a holiday background (snowflakes, snowmen, snow scene with trees and the like). You’re able to control the feed of photos to your liking with a pull-down menu of Instagram hashtags, such as Christmas, Hanukkah, and whatnot. It’s lots of fun. Check it out at Instacheer.com. Another year, another set of holiday cards. Actually, judging from our mail, lots of people are scaling back on traditional, USPS holiday greetings. (Uh, I guess it could also be we’re just not that popular.) Certainly the zeitgeist argues against going over-the-top with a lavish, expensive card. But here’s the great thing: With e-cards, you can still send out your holiday cards, without a lot of hassle, even if you haven’t given them much thought. And there are other options, too, like creating a quick holiday video to send to friends. I wrote a column last year about alternatives to holiday greetings. It puts the spotlight on Animoto, a really great tool for creating MTV-style videos without spending a whole lot of time on them.